Yes or No. 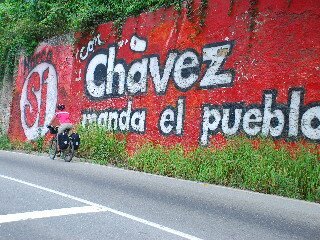 Those simple words were plastered, posted, painted, scratched onto walls, roads, billboards, shacks, signposts, you name it, throughout Venezuela. Rarely was a whole town or village in the “Yes/Si” camp or the “No” camp. Clearly the issue divided the country. Other signs simply urged people to Vote. 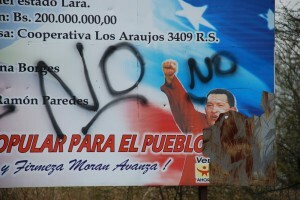 The issue dividing Venezuela was a package of reforms proposed by Hugo Chavez. It was a long list of reforms, and by the propaganda we read across our travels, anything he touched was considered a “revolution”. The vote the world, and much of Venezuela, paid attention to was changing the term limits for the president, and therefore allowing Chavez to remain in power indefinitely. The YES vote was clearly the organized and funded opinion. The signs were most often red spray-painted stencils of a cartoon bubble with only “Si!” inside. Some towns would have enormous billboards extolling the wisdom of the Chavez revolution. Signs of support were no doubt painted in broad daylight, while the opposition was more like graffiti. It screamed out where it could, or whispered when it needed. A large NO would be painted on the street or a small NO on the back of the stop sign. The NO was not organized or well-funded and most likely unknown who was behind the NO. For my own YES or NO vote, I tried to wait until I had given the country a fair shake. After traveling nearly a month through, albeit a small portion of this vast country, I am thrilled to say we are back in Colombia. Not only would my vote be NO against Chavez reform package (and for the record, the people of Venezuela voted NO back in January), but I also have to vote NO for a country that I want to return to. Not all countries are created equal, nor can I appreciate and enjoy all countries the same. Individuals we met across the board were warm, friendly, helpful — from the gal who served us a coffee with a free refill while sharing her take on the current political situation, to the fellow cyclist (in his truck) who stopped us along our last climb to say how excited and happy he was to see is in his country — we had very positive personal encounters. When it wasn’t personal though, when we were simply cycling down the road, in busy towns or lonely by-ways, more often our smiles were met with blank looks, turned down mouths or avoided eyes. It got so I sought out smiles and rewarded them with extra enthusiasm. I tried to coax waves from construction workers or school kids who would stop and look but rarely respond. Sometimes it felt like work. In contrast, we cycled across the border today into Cucuta and once again strangers pulled up alongside us on the road and said “Beinvenidos – Welcome!” and wanted to know where we are from. Smiles come easily from store clerks and internet attendants. More than the people of Venezuela being a bit “closed” as a traveler we met politely put it, Venezuela for me also has a feeling of repression and lack of pride. Pride in their country, their product, their service, their homes, their business. It’s very difficult for me to find something of quality or beauty that is man-made. The nature, the mountains, birds, flowers are stunning, but I’m hard-pressed to think of a building or handicraft or even a meal that was above par. What can I say except Venezuela offers more toilet seats and napkins than Venezuela … that those two banal things come to mind speak volumes. When we were first dropped on the side of the road at the military checkpoint, the increased level of traffic was immediately apparent. We hoped it was a product of a busy highway, but we quite often found traffic heavy even on smaller roads. Gasoline is extraordinarily cheap in Venezuela, making it possible for anyone who can scrape together a vehicle, literally, to drive anywhere and everywhere. It is cheaper to buy a tank a gas and drive across the country from Merida to Caracus than it is to buy a beer or a simple cup of coffee. A slew of 1970s made-in-the-USA cars fill the roads and roadside stalls supply oil and lubricants that these cars burn at an astounding rate. Many are held together with rust and a prayer and we can always, always hear them coming, making vehicle exhaust and noise pollution a part of every day life in Venezuela, and making more difficult for this cyclist to enjoy. 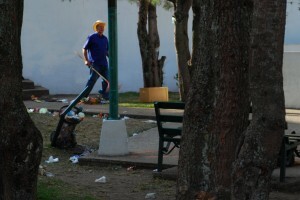 Our guidebook also warns that litter is a way of life in Venezuela … and it is. From the first day to the last, the roadsides were trashed with bottles and wrappers, doll parts and oil cans, construction scraps and dirty old hats. Worse is the whiff of something decaying in the weeds and it’s better not to look. Town squares were littered with the days discards of cups, bottles and paper bags. Passengers would toss the remains of lunch on-the-go out the window. For these two travelers, the constant assault to our senses was disheartening. Mr Extreme is the Trash Czar back in his neighborhood, so you can imagine that we always carried a plastic bag for our garbage and tied it on the back rack until we found a garbage can. Of course, that garbage can was most likely dumped over a cliff somewhere down the road. I know this happens in all countries. It happens more in developing countries and impoverished countries without infrastructure to “manage the waste”. The difference for me from some other countries was the amount of garbage dumped from mountain tops to river drainages. We came to think of the Venezuelan tourist motto as ” Looks Better at a Distance”. Close up brings a tear to the Native American eye. I’m curious to see if Colombia holds up to our memories of lighter traffic, cleaner roadways and friendlier faces. So far so good, be we are soon to start the next leg of the journey back to Bogota on main roads instead of unpaved, back-country tracks. As I look back on our time in Venezuela, I’d like to remember the best of our time there. We were able to wild camp high in the mountains, and my heart is most full when we’re stuffed in our little tent cooking soup and eating cookies. There’s a peace that comes in that solitude and comfort in the familiar or creating our own sense of “home”. Camping isn’t as easy or comfortable in Colombia when FARC forces are still a possibility. 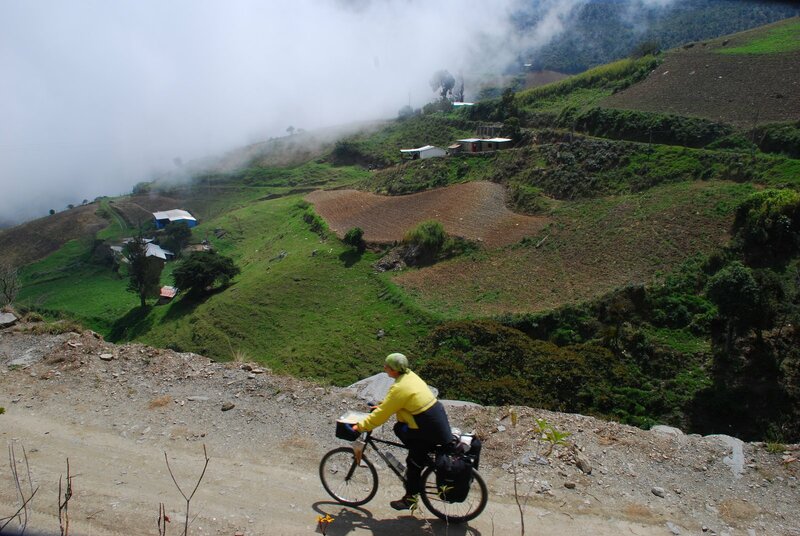 Venezuela also gave me epic climbs followed by glorious, sinuous downhills. Twisting and turning down a mountainside is worth the effort of climbing up the other side. Venezuela offered me the kind of downhill that lifts my spirit and requires only a touch of the breaks now and then. Those sweet descents watching the panarama unfold as we glided gently down the valleys will linger a long, long time in my memory of extraordinary roads traveled. I know this is a very old post, but I just read it today. Since my wife and I decided to take a year off to travel around Europe I’ve been following the adventures of pathlesspedaled. They just posted a link to your website, and that’s how I found the first comments I ever read from people that have traveled my own country by bicycle. First, let me tell you that you have gained my deepest respect for choosing to visit Venezuela the way you have done it. Especially for pedaling your way to the top of Pico el Aguila! Unfortunatelly, I agree with you on the point that sometimes Venezuelans are not the nicest thing you find in Venezuela. But I would only say this with regards to crime, vandalism and the garbage thing you talk about. I was very surprised to read that people along the way were not welcoming. Then I thought more about it… and I found the explanation of those blank and empty stares inside your own text. Let me explain. I left Venezuela over 10 years ago, so my perception of many things have changed since then. In order to understand, I had to go back in time and think about bicycles the way I did 11 years ago. Then it was clear: Those blank looks were just the expression of someone trying to figure-out: “WHAT is this in front of me?”. 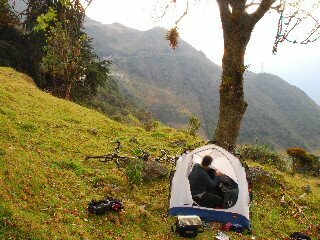 11 years ago I didn’t even knew bicycle touring existed. Bycicles were mostly toys for kids. You transport your kids’ bikes BY CAR to the place where they will ride them (sad, but that was my perception). If I saw a couple of people pedaling along the road on fully-loaded bikes I would have probably thought: “what are they doing?”, “how did they get here?”, “where are they going?”… “if nobody have stolen their bikes yet, they must have a couple of shotguns there in those bags”. The main reason for this way of thinking is, as you point out, ridiculously cheap petrol and an incredibly strong car cult. This also explains how excited was that fellow ciclist you met… he just belongs to a species which is very rare in Venezuela. I am thrilled you found this old post from our trip to Venezuela in 2008. Fun for me to reread and try and remember how I felt when I wrote it. What I can tell you after the distillation of time, is that I remember the very best parts of being there. This is true for all my adventures, the great moments live on in memory long after the struggles with the mundane fade away. I remember the wonderful individuals we met along the way, the kindness of strangers, the epic beauty of place. I imagine you are correct in thinking that most people who didn’t wave or acknowledge us as we passed, likely didn’t know what to think of us. It’s too easy to get wrapped in my own perspective to always think rationally from another’s point of view. Who knows, maybe some kid who watched us silently with a skeptical eye got an idea that he too would like to ride his bicycle to see the world. I’ll keep my eye out to see such a cyclist, and surely give him a welcoming wave. I hope you will too.